It’s Pet Day and Lily’s class has become a squawking, grunting, peeping, barking menagerie. Courtney has her hermit crab. Ahmed his peach-faced parrots. Ming has brought her grey mouse and Caleb has his puppy. But what does Lily bring? Her pet dragon, of course, but Courtney is not happy. ‘There’s no such thing as dragons,’ she says—and continues to assert as the hours go by. Everyone has lots of fun with their pets through the school day. The kids are asked to draw a picture of their pet and everyone loves Lily’s picture the best because she’s flying on her dragon’s back. All the kids wish they could be flying on their pet’s back. Except, perhaps, Courtney. After lunch, the class prep for the Pet Parade. Lily’s dragon is nervous but the parade begins in earnest, until Glen just happens to trip. You can imagine the chaos that ensues. Who can calm the chaos? 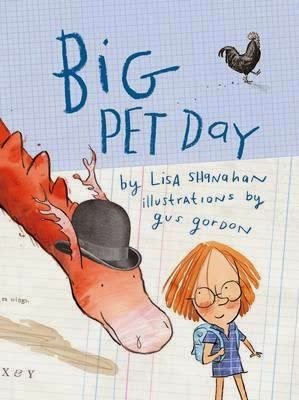 This is a fun story of a special school event, with a calm, sweet central character, a little bit of magic, and a lovely variety of children, both culturally and in terms of personality. A slice-of-life style narrative, the text has been superbly illustrated by Gus Gordon, with truly divine mixed media and typography that make for a visual standout of a book.